My brows have never been "goals" not ever, and was always okay with that, it wasn't a priority in my life. UNTIL, my sister started really paying attention to hers. We would take selfies on a night out and I would just shiver at my own eyebrows and I never want to be that girl with the bad anything, let alone eyebrows. Sounds pretty shallow right? But having a good eyebrow day just puts me in a better mood, like getting to leave work an hour early or getting home and beating a rainstorm by a matter of seconds, it just feels good. Anyway, my sister bought the Anastasia Beverly Hills Brow Pomade, and her brows were better than ever and I knew I had to get my hands on their eyebrow products. I'm pretty lazy when it comes to applying makeup, I needed something that I could apply fast but would still provide great results. THE PRODUCT AT FACE VALUE. The brow definer is a double ended wand with the angled cream based product on one end and at the other, a really well made eyebrow brush. The packaging is rose gold, and let's face it, who isn't a sucker for rose gold? The wand itself is glossy black with matte rose gold detailing and writing. It looks like a luxury product which I really like. The angled cream based product is SO good and you can really create any eyebrow shape and look that you desire due to the absolute control you have over the wand, sometimes using a brush can really limit the shade and shape you can create, whereas this product allows you to hold it like a pencil staying completely in control of your eyebrow destiny. It has such a creamy texture which enables the product to glide on with ease and gives you a natural finish that you just can not achieve with a pencil. The cream base also allows you to blend, which I never knew was a thing until I bought this product and it really does, again, enable to you to take full control of the shape, texture and shade. Before now, I only ever used an eyebrow brush to shape when I was plucking my eyebrows. 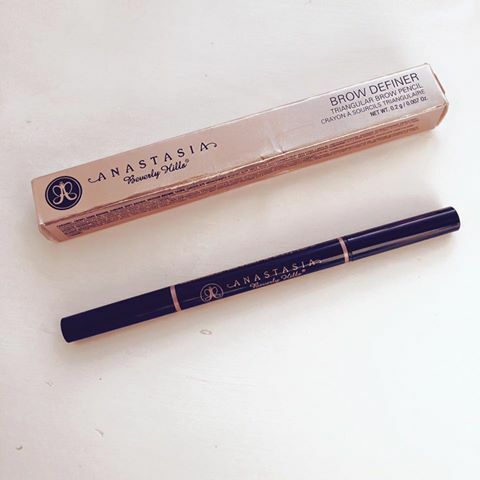 The ABH brow definer brush gives so much more than shape, it works as a blender too. Classically, you fade your brows to the middle, starting from out to the inside. I used to find this technique completely impossible, until I bought this product. The brush is an excellent way to blend and fade as well as to traditionally shape the brow. HONESTLY, I will be buying this product until the end of time, it has become a FIRM staple in my everyday makeup routine. Anastasia Beverly Hills are famed for their eyebrow products and I am fully converted like so many millions of women trying to create the perfect brow. It seems like a really trivial product for the price of £16, but I guarantee you will not be disappointed. The brow definer has given me the ability to transform my brows from caterpillars on my forehead to enviable eyebrows, with the highly sought after effect, that I could never achieve without it. I hope you have enjoyed this review and please leave me a comment below letting me know your thoughts on the product if you already have it. Also, if you have dip brow or brow wiz let me know if they're worth a buy in the comments below! Okay, I now need this in my life as well! I love ABH products. I've got brow wiz and dipbrow and I couldn't be without them!